An 11-story office building in downtown Perth in Western Australia was experiencing leaks from constant cracking. TRITOflex Australia came in and provided the perfect solution. 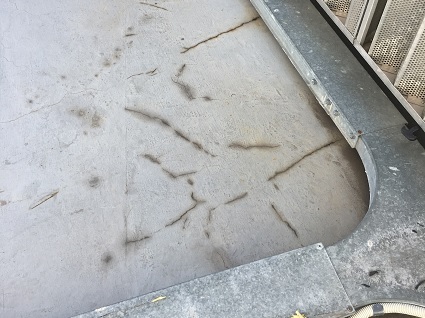 The existing concrete roof deck had been coated with various products over the years in an attempt to fix constant cracking, resulting in annoying leaks. A lot of money was spent each year to maintain the roof. After speaking with Triton representatives in Australia, they realized there was an economical, long-term option. 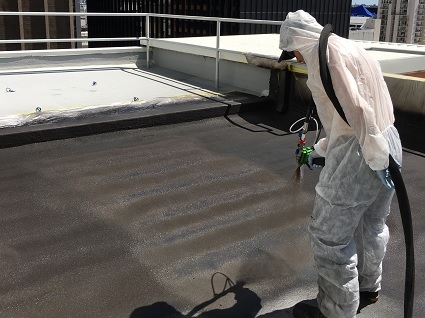 With the mobility of Triton’s spray machines, the applicators were able to operate from the top of the building. They simply ran a 100m air hose to the compressor on the ground. TRITOflex was installed at 1.5 mm (60 mils) dry in just one coat. This resulted in an instantly watertight roof as it was applied. All cracks and gaps in the concrete were sealed seamlessly. The TRITOtherm top coat with ceramic technology, ideal for Australia’s climate, was installed as a sacrificial top coat and energy efficient layer at 0.5 mm (20 mils) dry. The project resulted in a very happy client with a leak-free building. This roof system and warranty can be sustained indefinitely. The high quality seen during this project has led to further projects in the downtown Perth area.